Dirt Rally Driver HD is a fantastic racing simulation game in which you must test your driving skills in a vast open world. You can jump into a myriad of a different rally and sports cars and compete in a mind-boggling number of different races too. You must conquer the roads of three different countries and try to become the dirt rally champion. During each race, you will have to dodge a myriad of obstacles and also show off your drifting skills too. As you drive through the open world, be careful – it is destructible therefore you can’t just smash into the buildings and objects. So can you prove yourself as a top rally driver in Dirt Rally Driver HD Game? Car rally game with awesome high-quality graphics. Free mode: an open-world exploration to complete various trials and enjoy the beautiful map. 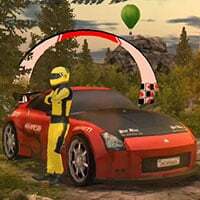 Racing mode: over 100 races with unique challenges. 19 awesome racing cars to buy and upgrade. A level system to access more cars and maps. WASD or arrow keys to drive. C to change camera. Space bar to use handbrake. M to open map (in free mode).